Episode 49 - Now that both sides are armed to the teeth and infested with vast armies, they are ready to talk peace terms. The Pandavas start the first round by sending Drupad's unnamed priest as their ambassador. This priest travels to Hastinapur and asks only for the terms of the Dice Game to be fulfilled. Dhrtarastra responds well enough, sending his Charioteer Sanjay as the returning ambassador. Sanjay's message is also for peace, but the terms are rather unacceptable. 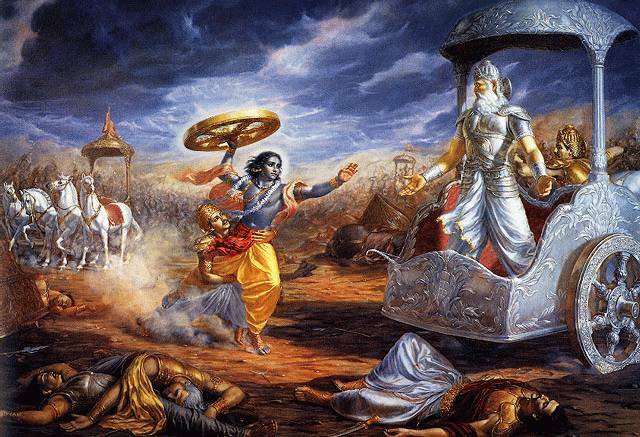 The Kauravas suggested that the Pandavas simply disarm, and go away. No land, no titles, no nothing. Yuddistira sends Sanjay back with his counter-arguments and counter-proposal. When the charioteer returns home, it is late, so he drops in on Dhrtarastra just to let him know he's back and will be delivering the Pandavas' rejoinders in the morning. Now the old blind king is left to stew all night. Dhrtarastra cannot sleep, so he summons his younger brother Vidur to entertain him. Vidur treats us to some lengthy speeches on virtue and Dharma, and by the end of the night, he is apparently channeling spirits! We hear from the immortal sage Sanatsujata, but this guy is apparently senile, because none of his teachings make any sense! Next time, we'll find out what the Pandavas have to say in reply to Dhrtarastra's niggardly terms.